February 6, 2015 By John P.
If you’re looking to do some metal working, or heck even wood working (or basically assembling anything!) you’re going to find that you sometimes need to have extremely repeatable and accurate joints for your materials. This can generally only be accomplished by using specific clamps or jigs, so I’m going to outline several options at a wide range of prices. There are products listed on this page which frankly I wouldn’t invest my money in, but it all depends on the use. If you need something cheap because you’re only going to use it once, or it might be in an environment where it could “walk away”, I’ve got a few listed. Generally you’ll see that I include both the strengths and weaknesses of each product, and you can always ask questions or for recommendations for specific use cases in the comments below. Technically this clamp is made for woodworking, but it can be used for thin material steel. The good news is, this is a cheap clamp. The bad news is that it will only accommodate material up to maybe 1″ wide, and it does not contain any quick adjustments or even knobs. The good news is, the Hobart is another cheap clamp. So if you only need it for rare or occasional use it might be Ok. The body of the clamp is aluminum. Better suited for light woodwork rather than work with heavy metal, with a cheap plastic handle and weak clamping action. The material that can be welded with this clamp is relatively small with a maximum T-joint size of 2 15/16″, HOWEVER, the perpendicular piece can only be MAX 1 3/4″. Miter joint max – 2 15/16″. The Strong Hand Jointmaster is basically a modified set of pliers with 90 degree positioners on each side. It will allow you to clamp material thickness up to 1 1/4in, so if you just want to weld up say some 1 inch square tubing these would get the job done. They are cheap enough to be just infrequently, and they would be very lightweight for carrying around if need be. The bigger brother to the Strong Hand’s series of pliers will actually allow you to clamp up to 3″ material together because it uses two separate clamps. Personally I would invest in this set for just a little more than the previous as it still gives you a 90 degree joint, but with greater material flexibility. The variable angle Strong Hand clamps are much like the 90 degree fixed version, except that they can be adjusted to hold material at any angle from 30° – 275°. They cost about the same amount, so if you need the flexibility of holding materials at various angles this might be the right tool. Otherwise think twice if you are always going to use them for right angles because you’ll have to constantly adjust them. The clamps listed above are useful for highly mobile situations, but for heavier duty use or higher precision situations its a better idea to invest in welding jigs which will speed up the workflow and last much, much longer. 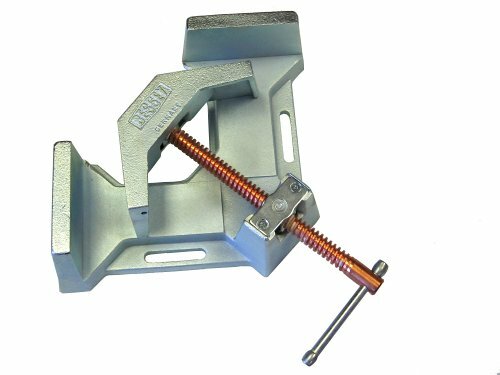 This Northern Industrial 90 degree angle clamp is made of cast steel with slotted base mounting holes and copper plated screws to help withstand weld spatter. The jig should hold materials up to 2 3/8 inches. One of the disadvantages of a basic jig like this one is that it lacks a quick adjust mechanism for rapidly clamping the material, such as those found on the Strong Hands jig listed later. This Bessey jig has a cast iron base, a copper clad forcing screw which resists getting fouled by slag and spatter, and built in oiling ports for the swivel points and screw. It’s a one-handed, self-centering jig and fixture clamp capable of holding 2.5″ material for “T” joints, and 3.5″ miter joints. Generally, the oiling ports and precision construction make this a superior clamp, but not everyone is going to be willing to pay more than for the Northern Tool variant. The Bessey WSM-12 is the bigger brother to the WSM-9 with a larger material capacity that will take up to 4″ material for “T” joints, and 4.75″ miter joints on each side. This clamp is worth the month if for no reason other than simply the larger capacity. In the long run, you want to purchase a few tools as possible to do as many jobs as possible. Now, that was a long way to go to get to my personal tool of choice, but its useful to see all the options in a wide range of prices. Personally, I purchased 4 of the Strong Hand Multi Axis Welder claps. These jigs will accommodate up to 3.75 inch square or round material at 90 degrees for secure fixturing during welding. These are heavy duty jigs that will last a lifetime (and then some). Precision milled surfaces on the cast steel platform make for extremely even and repeatable joints, and the quick adjust buttons on the clamps allow you to very rapidly mount and clamp material without having to thread the screws in and out the entire length of the screw. These clamps can be used for simple 90 degree two way welds, or to create an entire 90 degree corner. And I’ve used mine many, many times. They take all the worry out of building something with perfect angles. I know they are an investment, but a set of these will replace every single other clamp on this list. And frankly if you can narrow it down to just one set of tools for every possible job that is worth paying the extra money to me. If you know of other good clamps or jigs please share them in the comments below! I’d love to check them out and I’m sure they would be helpful to a number of other folks as well.